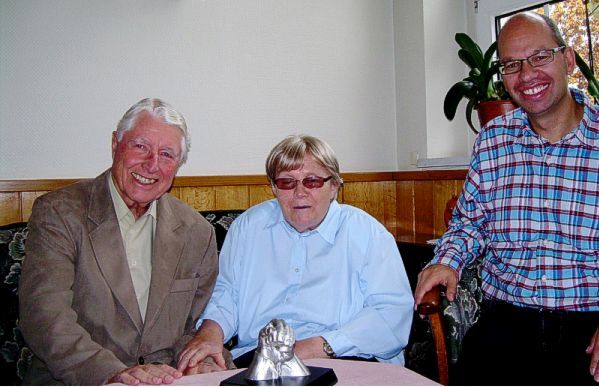 The first "Prayer Retreat for Global Concerns of the Deaf-Blind" took place from October 26 – 28, 2016 in the Counseling, Educational and Vacation Center of the Outreach Program for the Deaf-Blind of the Evangelical Church in Germany in Radeberg, Germany. Ten individuals from the field of deaf-blindness and some of their friends, mainly retired Pastor Volkhard Scheunemann (Global Outreach for Christ WEC International), Pastor Joachim Schmid (Foundation Help for the Deaf-Blind Switzerland) and Pastor Ruth Zacharias attended the Prayer Retreat. - Devotion to Jesus and a commitment to obedience. - Kairos is always crucial. - Persistence to the very last second. - Often more happens and in different ways than expected. - Leadership happens step by step in obedience to and under the leading of the Holy Spirit – and happens best with the addition of "witnesses". The second discussion session was about "Preaching and Counseling for Deaf-Blind Persons". The basis of preaching is always the diverse appearance of deaf-blindness: Up to 10 forms of communication are possible and necessary to reach deaf-blind persons without verbal communication. The Kingdom of God – the full mission with the different biblical scriptures moved us; the commission in Matthew 10:1,7,8; Luke 10:1-12,17 ff. ; the substitutionary suffering (2 Corinthians 4:10-15). Just as Jesus had compassion on people (Matthew 9:36) we need compassion for our commission; Luke 1:78-79 states God's heart of compassion for us. The third and fourth sessions focused mainly on the biblical, theological thoughts and reports from real life experiences discussed by Scheunemann, Schmid and Zacharias. The prayer times were very intense. The priestly intercession for this circle of persons became especially important to us. Our unity is found in God's international commission to preach the Gospel to deaf-blind persons. First practical steps to consider are: a second "Prayer Retreat for the Global Concerns of the Deaf-Blind" from October 24 – 29, 2017 in Radeberg, Germany. A Christian vacation week for European deaf-blind/visually and hearing impaired persons will take place from September 4 – 11, 2018 in Radeberg, Germany: "God's Blessing on Our Path." We are expecting contacts with multifaceted cooperation! Dieser Artikel wurde bereits 1783 mal angesehen.